The TrübTrapper is a boil kettle filtration system designed to capture the break material and pelletized hops – trub – in your boil kettle, and keep this unwanted material out of your fermenter, and your beer. It’s incredibly easy to use – before filling your boil kettle, place the TrübTrapper in the center so your dip tube is on the outside of the ring and then include a post-boil whirlpool step. That’s it! Break material formed during the boil can adversely affect fermentation and produce undesirable qualities in your finished beer. You worked to remove these unwanted by-products during the boil, why put them back into your beer? Professional brewers do all they can to make sure trub stays out of their fermenters, shouldn’t you? A small percentage of the overall trub will settle outside the filter ring during the whirlpool process, and some of it will flow to the fermenter. This small amount of trub in the fermenter is desired, and beneficial to yeast health and your beer, but excessive trub is detrimental. Excessive trub can coat yeast membranes impeding transport in and out of the cells which encourages metabolic by-products. It can lead to haze formation, poor head retention, aroma issues, poor flavor stability, flavor issues including sulfur compounds and soapy notes, as well as fusel alcohol creation and unplanned/uncontrolled harsh bitterness in the beer. With so many uncontrollable variables caused by excessive trub, consistency and repeatability in recipes is much more difficult, if not impossible. In addition to flavor issues from excessive trub, there are also cleanliness and sanitation issues. If you let it, trub is very good at finding its way into every part of your downstream system, from your chiller to your fermenter, and every fitting in-between. Excessive trub also affects your ability to harvest and re-use yeast. High trub levels make it more difficult to collect and clean the yeast, and poor yeast health caused by excessive trub eliminates the ability for you to maintain consistency and repeatability in your yeast generation to generation, and so too your beers. Clean the TrübTrapper prior to use. Place the it in the bottom center of your boil kettle before you fill it so the silicone gasket is in full contact with the kettle bottom and your dip tube is outside the ring. Trub is retained inside the ring, wort is collected from outside the ring. If your dip tube is too long the Big Dipper (BE560) is an excellent option, and designed specifically to work with the TrübTrapper. There is no ‘top’ or ‘bottom’, so the TrübTrapper can be placed in either orientation with equal effectiveness. Fill your kettle as usual and boil. No further interaction with the TrübTrapper is necessary until clean-up. 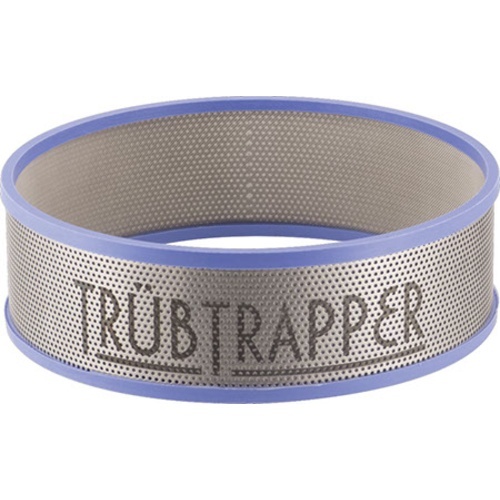 Note that the TrübTrapper has been developed for boil rates typical for brewing; excessively wild boil rates can cause some movement of the filter from the exact center of the kettle, but won’t affect it’s function. At the end of the boil, whirlpool the wort to create a trub cone. You can use a variety of methods to create the whirlpool including a paddle, long handled spoon, or a dedicated whirlpool pump. Please ensure you’ve fully sanitized the tool you are using to whirlpool with, before it comes in contact with your wort. Whirlpool for approximately 10 minutes, then rest for 15 minutes to allow for further settling. Experiment and use the procedure that works best for you, your system, and your brews. Drain the wort per your normal process. When the wort level reaches the top of the TrübTrapper simply adjust your drain rate to match the flow rate through the TrübTrapper to maximize wort recovery. A small amount of wort may remain inside the TrübTrapper after you’re finished draining, depending on your process. A small percentage of the overall trub material will settle outside the filter ring. 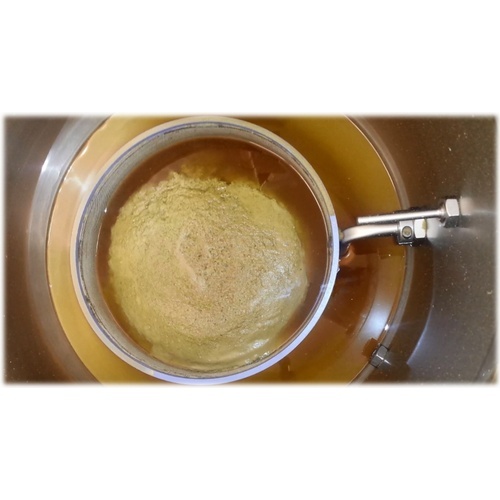 This small amount which flows to the fermenter is beneficial to yeast health and your beer, but it too can be virtually eliminated if you desire, by reducing your drain rate significantly at the very end of the process. Clean the TrübTrapper immediately after use by back flushing generously with hot water, then follow your normal cleaning process. All commonly used cleaning products and methods are acceptable for use including PBW, Easy Clean, boiling, etc… As with other stainless equipment, do not use cleaners with chlorine. Please note: Whole leaf hops should be contained in a hop bag or spider when boiling, then removed from the kettle before whirlpooling when using the TrübTrapper. Plugged the boil kettle outlet and lost a lot of wort on my last brew without this! My homebrew shop switched to all pellets. They clog my dip tube screen, so I have been using nothing and letting all the trub in. I cannot seem to find a good way to keep pellet hops out, despite whirlpooling. I want to keep trub out of my wort chiller and fermenter. Liked it, but I burnt the old one on accident. I'd like to use this in a 20 gallon BME SS Brewtech kettle. Will it be too small? BEST ANSWER: I use mine on a 20 gallon Blichmann G-2. I perform a ~20 minute whirlpool prior to sending to a plate chiller and have had no problem with trub in the cooler. I flush and back flush the cooler and sanitize in the oven. I've used this for over a year and it does a great job trapping all the mung. Also use the true trapper from Blichmann - Anvil brand that clips on the pickup. It will not cover the whole bottom of kettle. I use it in a 15 gallon Blichmann and it leaves about 1-2 inches between the Trapper and the wall of kettle. However, if you do a whirlpool, most of the hop matter will settle in the middle of the kettle and inside the ring. I use mine in a Ss Brewtech 20 gallon and it works fine, the whirlpool speed is the important part, more speed brings the trub to the center. Happy Brewing! I use the trub trapper in 15 gallon kettle and it works great. If you get a nice whirlpool going it should still be plenty large enough to do the job. No, it will work like a charm. As long as it fits inside your wort cooler. Wish I bought this thing 10 years ago! Yes, it will be small. Especially if you're going to produce very hopped beers. It should be fine. I use mine in the 15 gallon kettle and it works just fine. I just received my trap but now I'm not sure if I got the correct size. I have a Grainfather but should I get the smaller size. I have not used it yet so I can return it if I need the smaller size. Any suggestions? BEST ANSWER: Hello John - The smaller Trub Trapper is designed for batch sizes less than 10 Gal. Perhaps this would be a better fit with the Grainfather. Worthless - what is the return policy? I don't really write reviews because most of the time my response would be "works as expected". But not in this case. The Trub Trapper is completely worthless. After a 10 minute whirlpool and 15 minute rest (per the instructions) it would barely drain. This added an additional 30 minutes to the end of my brew day. Then, it turns out that it didn't actually trap ANYTHING. My dip tube clogged, my pump clogged, my plate chiller clogged. I easily spent an additional 30 minutes taking everything apart to fix the problem. So if you want a device that doesn't do anything it says it does and adds an additional hour to your brew day, I will send you mine. If you want to keep hops and trub our of your wort, look elsewhere. Hello Robert - Thank you for your honesty, we have seen mixed reviews on these. We offer a 60 day return policy. Good option for filtering trub. I’ve only used this device once so far but I’m happy with how it contained the trub after I did my whirlpool. You need to be careful to keep the Trapper centered in your boil kettle. My one time using it, this was not difficult to to. So far it seems like a good addition to anyone who is already whirlpooling. Does work sort of... the silicon border is hard to get back on track once it comes loose. You also have to be careful that you don't miss the ring while whirlpooling which can be hard because it's hidden at the bottom of the kettle. I just need practice with it I suppose. I'll let you know after my next brew! Love this thing. It works well in both 10 & 15 gallon kettles. I worlpool at the end of the boil, let the Trub settle and drain down until I can see the top of the hop cone, then gently position the trube trapper around the cone and most of the Trub is contained! Trubtrapper works great in my Speidel 20plus. Efficiently keeps all the hop and break materials contained. I would not recommend this product. I used it once placing it in the middle of my boil kettle then whirlpooling. The trub all settled down in the trap but the trap got so clogged up that that wort would not drain through it. This was not a big hoppy beer, this was 5 gallons with only about 1.5 ounces of pellet hops. I grew so frustrated with it I just pulled it out and have never used it again. This tool has not worked out the way I was hoping that it would! I wish that I did not spend my money this product. Trub Trapper works very well. whirl pooling is a time tested way to drop the majority of trub into a pile in the center of your kettle, away from the pickup tube. Because the inside of the Trapper will fill with trub & hops it will remain full while outside the Trapper wort has fallen below the pickup tube. If I wait a short while the rest of the wort will slowly drain out leaving the trub behind. By sucking on an outlet tube attached to the drain valve, siphoning will begin again to get the last usable wort. My problem was removing the trub/hops from my wort when transferring from my Grainfather to the fermenter. The Trub Trapper solved my problem. It works as advertised. Make sure to do a decent whirlpool and then let it settle for about 20 min. Happy with it. I read the 5 star reviews and got sucked in and bought this. I?ve done 2 brews with this and this equipment is what I feel is not useful. Specifically. 1. 4 oz of hop pellets in a 10 gal boil over flow the trub catcher. Maybe 75% of the hops are initially captured. If you?re doing more hops, forget it. 2. While the kettle pours out the trub catcher?s mesh is completely clogged and hold almost a pint of wort. The mess is useless. You are better whitlpooling without this device. Just pour out at a rate that does not disturb the hops. You?ll have one less item to clean and get better results. If whirlpooling does not work think about using a mesh tube that screws to the inside of the kettle port. It will clog but with a little scraping with spoon it does a good job. I whirlpooled with my pump through my tangential port for 15 minutes and allowed to settle for 5 minutes. The trapper shifted off center and was more like a dam. I'm going to give it another try and make sure it's sealed to the bottom of the pot and not boil so vigorously. I've just completed my second 10 gallon batch using the TrubTrapper. My setup includes a SS BrewTech 20 Gallon Boiler wherein I use the Big Dipper - 1/2" Pickup Tube and a Whirlpool Return add on kit. This setup has - by far - been the best effectively removing >90% of mash particulates/sediment and any boil-time adds (e.g. hops). When under whirl, my pot achieves a definitive cone and thereby 'lifts' and deposits sediment accordingly. For test purposes, I've used the setup with both leaf and pellet - the latter far better for conical sediment formation; in fact likely closer to 95% sediment stacking. Note: I use a plate chiller and as such do not run into the obvious potential issues with an immersion chiller using this setup. 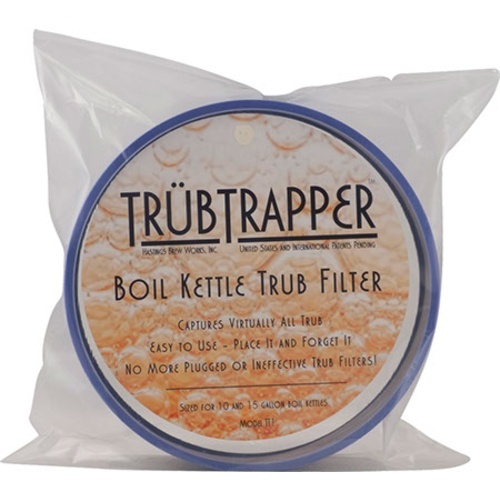 I ordered the TrubTrapper in order to help retain the hop pellet, hot- and cold-break sediment in my 15 gallon round bottom boil kettle that has a 15.75" inner diameter, primarily so that I could recover more wort and have less volume loss. The design and construction are superb, and the silicon on top and bottom edges are sufficiently heat tolerant and flexible enough to readily make a fast seal with the kettle bottom. The silicon seems to roll off the steel at times, but goes back readily. Following a good whirlpool, the sediment settled inside the ring and was effectively retained; the height of the device is appropriate to the task. In my experience, there are two things you will want to consider when entertaining whether this device will work well for you. One would be, if you use an immersion chiller, how it will work in your work flow? Will your immersion chiller fit inside or over the top of this device, or are you willing to put it in after chilling? I found that latter to be a viable option. A second would be, is it sufficient diameter for the amount of sediment you hope to catch. I found in my use that one closer to 13" diameter would have met my needs even better than the 9" one. Taken together, I highly recommend this device to fellow brewers.